Cleansis is a Awesome Masonry blog style theme that allows you to choose from a 8 Post Formats. 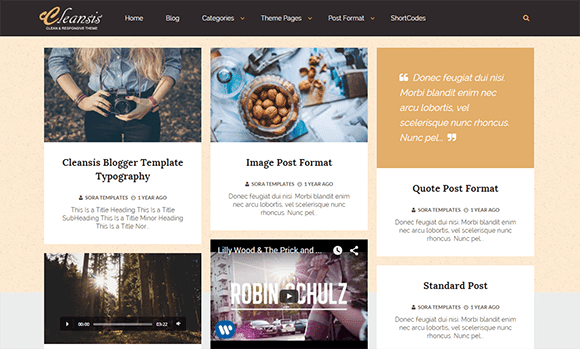 Cleansis Blogger Template will surely amaze you at the first sight. It is the fully responsive HTML5 & CSS3 template that best used for blogging, personal portfolio, even business portal. The template layout and mechanism are enhanced to deliver all images and graphics with WOW effect. Cleansis blogger template works seamlessly on a wide range of devices including PCs, mobiles, laptops, etc. It has the sophisticated layout with colorful design and carefully crafted graphic (that is retina supported) helping you to attract more visitors to your website.